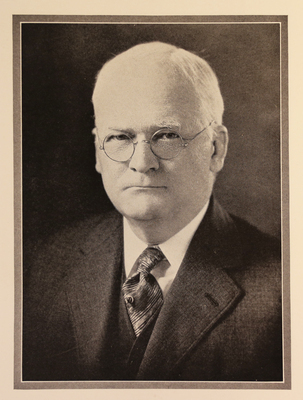 In 1922 John Garland Pollard accepted a professorship at William & Mary, beginning a seven-year tenure that included him being appointed dean of the College of William & Mary’s Marshall-Wythe School of Government and Citizenship in 1923 – the college’s first organized law program since the Civil War. His classes, on diverse subjects from Virginia history to international law, were popular, and he ingratiated himself with the community, becoming mayor of Williamsburg and assisting in the building of Colonial Williamsburg. Pollard received his LL.B. from Columbian College (now George Washington University) in 1893 and became engaged in the practice of commercial and corporate law. He successfully ran for attorney general of Virginia in 1913, but lost his bid for governor in 1915. His ambition for higher office, however, led him to run again for governor in 1929, this time winning the second-largest majority in Virginia history. He would maintain the title of dean of the School of Government and Citizenship, though was on a leave on absence from 1929-1932. After his governorship, Pollard was appointed to the Board of Visitors of William & Mary. He died in Washington in 1937.